Hurricane Irma was the most powerful Atlantic hurricane in recorded history. It was a Category 5 storm when it made landfall on Barbuda on September 6, 2017. Its winds were 185 miles per hour for 37 hours. Those winds extended 50 miles from the center. Tropical storm-force winds extended 185 miles from the center. Its coastal storm surges were 20 feet above normal tide levels. Sweltering ocean temperatures of 86 degrees Fahrenheit sustained the storm. Irma held 7 trillion watts of energy. That's twice as much as all bombs used in World War II. Its force was so powerful that earthquake seismometers recorded it. It generated the most accumulated cyclone energy in a 24-hour period. Irma's attack was the first time in 100 years that two storms Category 4 or larger hit the U.S. mainland in the same year. Hurricane Harvey devastated Houston on August 25, 2017. President Trump declared emergencies in Florida, Puerto Rico, and the U.S. Virgin Islands. On September 6, Florida's governor ordered residents of the Keys to evacuate. September 6, 2017: Irma hit the Leeward Islands with winds over 180 mph. The Prime Minister of Antigua and Barbuda described Barbuda as "barely habitable." September 7: Irma left hundreds in Puerto Rico without power. It hit the northern part of Haiti and the Dominican Republic with 15 inches of rain. September 8: Irma remained a Category 5 hurricane with wind of 175 mph. It affected the Turks and Caicos Islands and eastern Bahamas. The storm passed over waters warmer than 86 degrees Fahrenheit. Barbuda's government issued a watch for Hurricane Jose. September 9: Irma affected the north coast of Cuba flooding Havana. Winds at approximately 150 mph and waves of up to 36 feet. Wind gusts of 55 mph hit southeast Florida. Storm was downgraded to a Category 3 but was projected to regain strength before hitting Florida. September 10: Irma was upgraded to a Category 4. It hit Cudjoe Key, 20 miles north of Key West, and then Naples. Miami didn't get the core of Irma but still received life-threatening conditions. The Florida Keys received approximately 12 inches of rain and a 10-foot storm surge. Rainfall averaged 10 to 15 inches. September 11: Irma downgraded to a Category 1 hurricane as it headed to Tampa. Twelve million people were without power. Irma was downgraded to a tropical storm as it hit Georgia. There were 1.5 million people who lost power. The state had ordered people to begin evacuating on September 9. The death toll was 129 people, according to the Centers for Disease Control and Prevention (CDC). Irma damaged 90 percent of the buildings on Barbuda. It destroyed almost all communication and left 60 percent of the population homeless. The government evacuated 1,800 citizens to Antigua. Florida officials ordered 6.5 million people to evacuate. There were 77,000 people in 450 shelters. The most rain in the state fell on Fort Pierce. It received 15.9 inches. The strongest winds at 142 mph hit Naples. Irma hit Miami with winds up to 73 mph. Three cranes collapsed and streets flooded. Miami-Dade, Monroe, and Broward counties' building codes have the nation's highest wind standards. They improved their preparation after Hurricane Andrew hit in 1992. But that might not offer enough protection. “There’s no structure in Miami that’s built to withstand 185 mph winds,” stated Keith Wolfe, president U.S. property and casualty for Swiss Re. But roughly 70 percent of the region’s buildings were built before 1994. Many of them have not been retrofitted. Even high-rises built to higher wind codes will suffer from heavy rains that seep in through roofs. According to the National Oceanic and Atmospheric Administration's Office for Coastal Management, Irma had a total cost of $50 billion. Irma threatened $1.2 billion in Florida's produce crops. The state is America's second largest grower of vegetables like tomatoes, green beans, and cucumbers. The potential shortage pushed orange juice futures and sugar prices higher in the days leading up to the storm. If Irma had hit Georgia and the Carolinas hard enough, it would have affected corn, soybeans, cotton, and peanut prices. Irma would have done more damage. But Florida learned from Hurricane Charley in 2004 and Hurricane Andrew in 1992. The state revamped building codes to make houses more resilient to hurricanes. As a result, 80 percent of the homes in Irma's path were built to better withstand the storms. Despite the new codes, Florida is the highest-cost state for homeowners insurance. Floridians paid an average $3,575 on a $200,000 policy with a $1,000 deductible. That's double the national average. Global warming contributed to Irma's impact in three ways. First, rising sea levels made flooding more likely. The sea level around Florida is rising six times faster than average. Most of that is because of El Nino and other regional variations. But global warming aggravates these natural cycles. That's because warmer temperatures have melted the ice sheets in Antarctica. From 1992 to 2017, the Antarctic ice sheet has lost nearly 3 trillion metric tons of ice. Second, South Florida’s average August 2017 temperature was four-tenths of a degree above normal. Florida’s average temperature from January through April 2017 was the warmest during that period on record. The 2016 season was the warmest since 2010 in South Florida. Seven of the past 10 summers have been above normal. Warmer air holds more moisture, so it's less likely to rain. But when it does, the water falls in buckets. That makes for greater rainfall during a hurricane. Third, global warming slows weather patterns. That allowed Irma and other storms to move much slower than normal. They had more time to wreak damage. Irma's size and strength destroyed whatever was in its path. It was Category 5 with 185 mph winds and storm surges bringing waves 20 feet higher than normal tides. That would significantly impact Miami. The sea level is rising 3.4 millimeters a year due to global warming. Since 1992, its risen 3.34 inches. That means Miami Beach now floods during "king" tides. 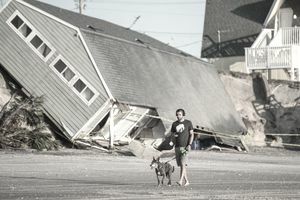 That three-inch increase doubles the cost of damage from hurricane-related storm surges, according to Swiss Re estimates. Hurricane Katrina cost $100 billion. It was a Category 5 hurricane that flooded New Orleans. Most of the damage was caused by storm surges that overwhelmed the levee system. Hurricane Harvey cost $125 billion. It was a Category 4 hurricane that dropped more than 50 inches of rain. The resultant flooding covered two-thirds of Houston, Texas. Hurricane Maria is the third worst, creating $90 billion in damage in Puerto Rico. Hurricane Sandy hit New York and New Jersey in 2012. It left $70.2 billion in damage. Hurricane Irma is the fifth most costly storm at $50 billion. Compare Irma to the 20 most destructive hurricanes in U.S. history.